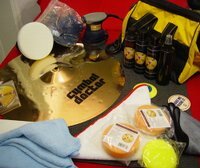 The complete Cymbal Doctor kit, which features a powerful, lightweight, 400 watt, Random Orbital Polisher for high volume usage with one year warranty. Much more powerful and quicker than the Home Pro Kit, with bigger polishing pads, so best for shops restoring or maintaining cymbals for sale and professional touring bands. Additional bottles of product can be purchased on application. Just think how much more your second hand cymbals would sell for if they were perfectly shiny ? How much better they will look at concerts in photographs and videos?